BUT beside that Anime Expo was pretty damn fun. I didn't really hit up any panels but I got to talk to so many amazing cosplayers and fellow anime fans that it really made up for standing in line for so long. Plus it was so fun to have other people recognize my cosplay! As I have said before, I love putting a twist on classic characters (which makes me sometimes hard to recognize) and Neon Genesis Evangelion is one of the most classic anime every made, so of course I wanted to cosplay something from it for Anime Expo. The only problem is that I don't really like any of the human characters! 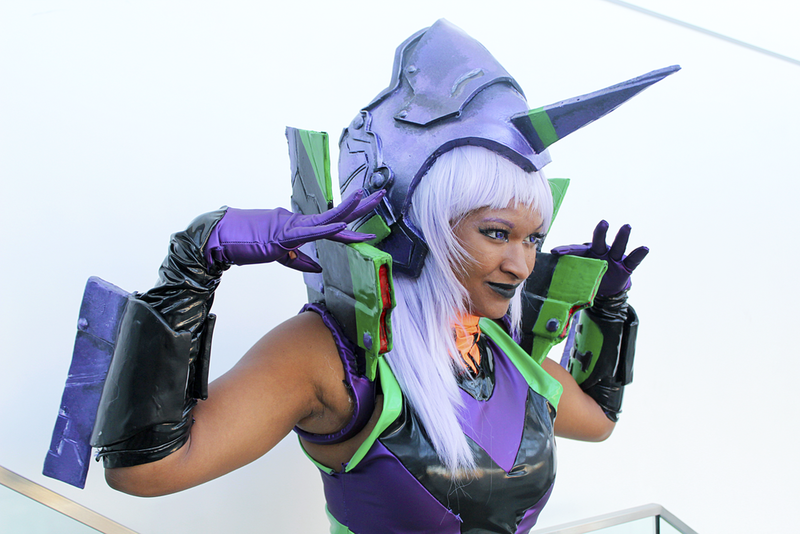 But I always did like the Eva Units, so I decided to do the most classic mecha, EVA Unit 01. I just knew that I wouldn't be able to handle wearing a full mecha cosplay so to compromise I designed a dress version. This dress and outfit was the next step in my sewing and cosplay journey. Before this I had never sewn latex before, and it was quite the challenge. However, THANK GOD for Ya Ya Han fabrics! Her fabric (the purple portion) was much easier to sew than the straight up latex portions. Beside that I think I am slowly getting better at working with eva foam and worbla! Working on this one cosplay has given me a lot of confidence for future cosplays (which I have the next five planned). I am literally sitting here planning my next cosplays and am so excited and the thought of showing my hard work. Until then TTFN, ta ta for now. Giant Hat says "I'm Busy"